Storm clouds above Yellowstone Lake. Invaders below. A 7:15 a.m. flight requires you to be up and on the road early. Fortunately, the Jackson airport is close to town and small; there were no lines at check-in or at security. And, you get to see that early morning light on the Tetons. Quite an improvement over Laguardia. as a benchmark for Yellowstone Cutties for decades. As I sat outside of security putting on my boots a woman sat next to me and stated that she was homesick and ready to go home. She asked me of I felt the same. I said, "No, I could stay here forever." Coming home brings me back to the beginning. While there are many thoughts and memories yet to be cataloged from my trip to Yellowstone, on the flight home I found myself rereading the Native Fish Conservation Plan for Yellowstone National Park. I now have terrific context through which to view this plan. As the plan's title indicates the true purpose is to restore and protect native fish in the waters of the park. This is important not only for the fishery itself, but for the entire ecosystem that is dependent upon these native fish being where they're supposed to be. The best example of why the natives are important to Yellowstone is in the displacement of native Yellowstone Cutthroat Trout by invasive Lake Trout in Yellowstone Lake. Over 30 species, from Grizzly Bears to Osprey to Mink, count on the Yellowstone Cutthroat making spawning runs into rivers and streams where some of them can be eaten. 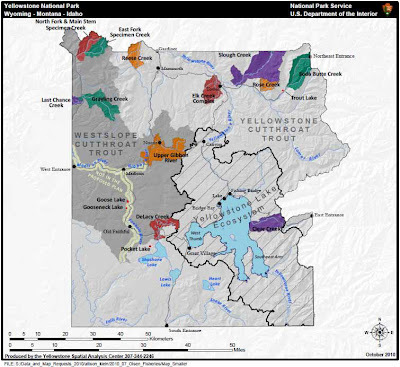 Historical ranges and watersheds for native trout. You can't trade Lakers for Cutthroat in this example because Lakers don't run up the tributaries. Lakers spawn in the lake in waters too deep to be accessed by wildlife. It is a case where not having natives isn't a philosophical issue but a fundamental one. They are not available as food for animals. And they're not available to most anglers. "....preserves abundant and diverse wildlife in one of the largest remaining intact wild ecosystems on earth...." - March 1, 1872 Act of Congress creating Yellowstone Park. So with a legal, regulatory and natural mandate to preserve and restore these fish populations, what the heck are they doing? The Plan has the following goals:. Creation of sustainable native fish angling and viewing opportunities for the public. I especially like that last one. Natives have been under attack for generations. These goals are simple to understand and far more difficult to realize. Not only has the unofficial introduction of the Lake Trout had a stunning impact on the Yellowstone Lake Cutties but so has decades of official stocking by the park. While stocking of trout ended in the 50's there are currently wild populations of Rainbow, Brook and Brown trout in many waters in the park including the marquee rivers. 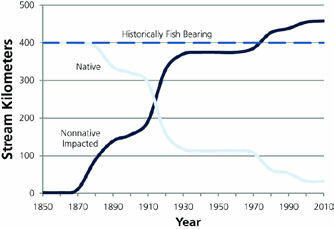 Native trout are at an all-time low in many waters. 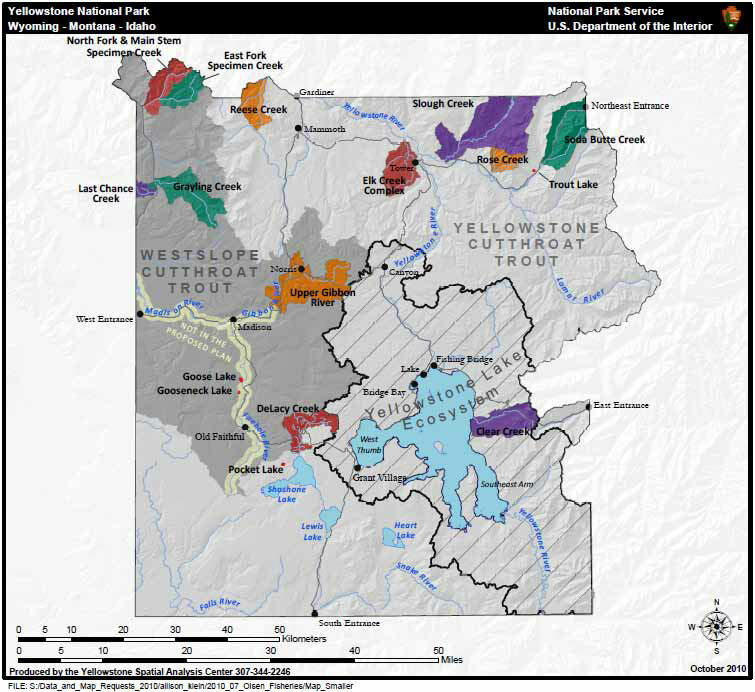 The plan divides the conservation approaches and measurements between Yellowstone Lake and its tribs and all other rivers, streams and lakes in the park. 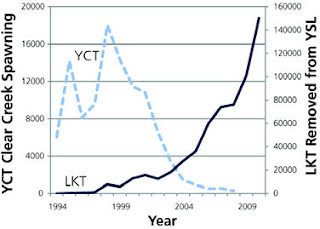 Increase large-scale suppression of lake trout (LKT) to reduce the population by 25% each year (annual fishing mortality rate of 0.56). Maintain surface water access for spawning cutthroat trout in at least 45 (75%) of the 59 known, historical spawning tributaries. Recover YCT abundance to the average observed during the five years following LKT discovery (1995–1999; average of 12,800 spawning YCT at Clear Creek). Preserve and/or restore genetically unaltered YCT to maintain their current spatial extent in streams (3,300 km, which is 75% of the 4,400 km that historically contained YCT). Restore genetically unalteredWCT until they occupy at least 200 km (20% of 1,000-km historical WCT distribution). Restore fluvial GRY until they occupy at least 200 km (20% of 1,000-km historical GRY distribution). For Yellowstone Lake, netting is the current strategy to remove the Lakers though going after spawning grounds is something that will be piloted this fall. There's a bit of a technology leap required to make it work. I'll have a post later that will describe the work being done on the lake. On the streams, creating fish barriers or utilizing natural barriers will be the first stage in a strategy that will eliminate invasives and then repopulate with pure strain natives. Again, that'll be another post for how they'll do it including a fascinating tale of how native Westslope Cutthroat populations, once thought long gone, were rediscovered. So, enough about science and policy. I'll follow this up with a fishing story on Wednesday. Not only is it a tale of fishing for natives but there's a peek at the impact of invasive trout as well as a bear story all wrapped into one. Marc fishing the Gibbon River. Brown Trout are the norm here. West Slope Cutthroat should be here. 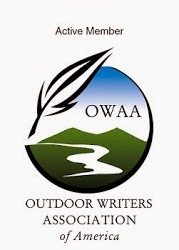 Editor’s note: In June, Trout Unlimited, along with Simms, the Yellowstone Park Foundation and the Outdoor Blogger Network, held an essay contest. Two winners, Marc Payne and I, were selected to attend the second annual TU Blogger Tour–this year’s tour took place July 24-28 in Yellowstone National Park. A great and important backdrop, Steve, and well articulated. I'm glad you got to see the plan in action. Thx, Mike. It was very cool to see all these passionate, smart people driving this thing forward. It was especially cool to see the government doing something worthwhile, well. No waste. No BS. Good public/private partnerships. Thx Brk. Yeah, that's going on the wall. As you stated, the goals are easy to understand, but hard to realize. But like anything, you gotta take the first step in making it happen. Hopefully, people realize the importance of these native fish, and continue to set goals to help save them. There's a lot of support for this work though I'm sure behind the scenes there's been a lot of wheeling and dealing to make sure that none of the stakeholders feel slighted. Have you ever wondered who the guy is that released the first LKT into the lake? Do you think he's sitting back relishing his success or is the guilt gnawing at his gut like a warm PBR? I realize none of that really matters given the seriousness of the situation but I'd sure like to know his name, and gps coordinates. Great write up, Steve. We knocked that around when we were up on the lake. The guys who work this problem full-time have no desire to even discuss the topic. They're focused on what's in front of them. It's admirable. The rest of us want to hunt him down and introduce his sensitive bits to a fish hook. Very interesting read and very sad at the same time...thanks for putting this out there for more of us to learn about!